Rubber screeching across pavement, followed by the metal-on-metal crunching of an accident, is one of the worst sounds you'll ever hear. It's the fingernail-on-chalkboard of the daily commute, because it means your car's damaged, and you've got a bureaucratic nightmare headed your way that might take months to go away. What do you do, then, when you're in a fender bender? NOTE: this is about minor collisions. If there's something serious, I sincerely hope you know to call 911 before doing anything else. Make sure you've got a first-aid kit and fire extinguisher in your car, and that your insurance information is in the glove box. Program an ICE number into your phone, if you haven't already, and keep it written on a card in your wallet or purse as a backup. Leaving the scene of an accident with significant damage or any injury is a crime, in addition to being a pretty crappy thing to do. If it's a pretty minor fender bender, though, go ahead and move your car out of the flow of traffic once you know everyone's fine. This might seem like common sense, but people tend to have all sorts of weird reactions when their flight-or-fight response system kicks in. Consciously remind yourself to stay calm, and check to make sure you don't have any injuries you just haven't noticed yet. Then check on your passengers, and then anyone else involved in the collision, before you check the damage on your vehicle. Except for when you're gathering contact information from people. Really, what you want here is to avoid admitting fault, because that can potentially open you up to liability issues. Even an, "Oh, I'm so sorry!" 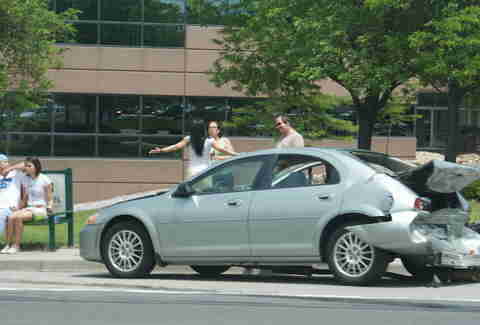 could be a problem if the collision is worse than you realize and the other person is litigious by nature. The legal requirement for this varies by state, but as a general rule, whenever there's any injury or damage above $1,000 you're supposed to call the police and file a report. Use the non-emergency line unless it's actually, you know, an emergency. The officer will talk to you and the other driver(s) separately, and note the circumstances (weather, type of intersection, etc.). He or she might also issue a citation if one of the parties broke a traffic law. If that happens, you've got a pretty straightforward path when you talk to the insurance companies. You need contact info, not just for the person who hit you, but of everyone around. 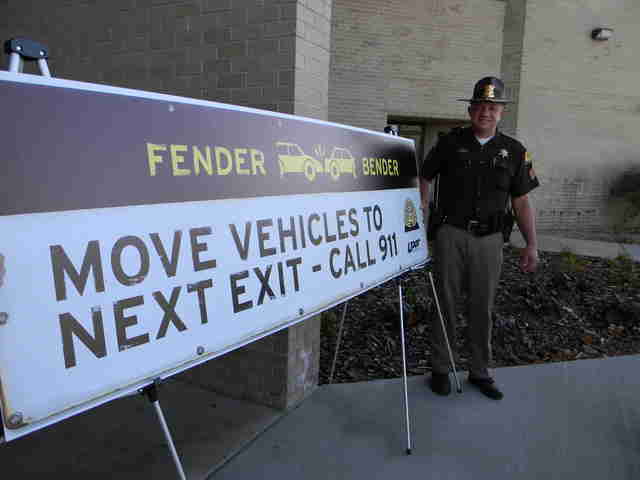 That includes the random bystanders who saw the fender bender, the passengers in the other car, and the name and badge number of the responding officer. And I do mean everything. Whip out your phone and start snapping away. Remember, in most states, fault is determined by laws (see above, re: Johnny Law) rather than whether or not you think the other party was driving like an idiot. When you take photos of the street signs, curbs in the area, potential debris on the ground, that half-eaten sandwich the other driver was probably eating, and, of course, every inch of the damage on both vehicles, you're giving valuable information as to exactly what happened. Keep what happened on a need-to-know basis until it's all over. Again, if it's remotely serious, you really don't want that dirty laundry aired in public. Insurance investigators scour the net when there's something even vaguely suspicious, so even if you did absolutely nothing wrong, keep your mouth shut lest something get misconstrued. Assuming you're physically alright, this really needs to be the first step when you get home -- or to work, or wherever you were headed when your day went south. If you're at fault -- and, c'mon, if you are, you know it -- call your agent and be upfront with what happened. They're not the one you worry about, so don't give them a song and dance. 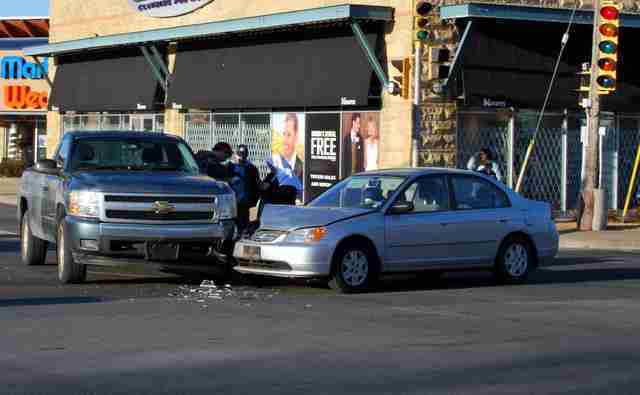 If you're the innocent one, get on the phone with the other driver's insurance pronto. If you wait too long, you're setting yourself up for complications, up to and including denial of claims, depending on the situation. Your insurance company wants to spend the least amount of money to get your car fixed -- or not get it fixed at all, if it can get away with it. Before the insurance company sends someone out to look at the car, you definitely want to get the damage independently appraised, preferably by several shops. Your numbers probably won't sync up with what the insurance company tells you, and the person on the other end of the line is just hoping you'll say "OK" and move on. 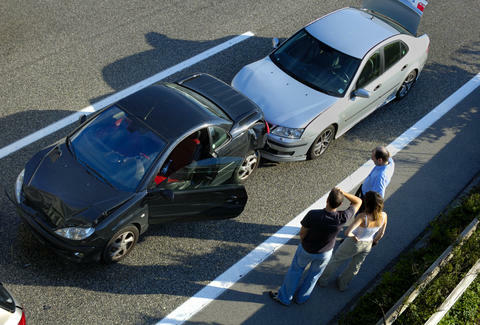 Be prepared with evidence that supports your higher claim. What's on OEM part? It stands for "original equipment manufacturer," and it means the parts are either built by the company that made your car, or by the same company that built them for the company that made your car. Generally speaking, the newer your car is, the easier it is to get the insurance company to capitulate, rather than springing for cheaply made parts that invariably don't fit quite as well. What's diminished value? Let's say your car was hit pretty badly, but fixed so well that no one on the street or riding along would ever be able to tell. When you go to trade your car in, any inspector worth their salt will notice tell-tale signs of a collision, and offer you less money. 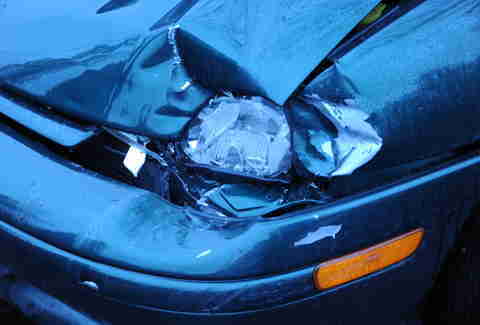 To counter this, you can request compensation for that diminished value from the insurance company. This doesn't mean you'll get all of the loss, and it doesn't mean you're absolutely entitled to it if the damage was minor and fixed at a first-rate shop with OEM parts, but it's a good start. Just remember, your goal isn't profit; it's to be made whole again, which means that you should have everything you had before -- at around the same value. Aaron Miller is the Cars editor for Thrillist, and can be found on Twitter and Facebook. He wishes he had all of this info years ago, when he was hit ever-so-slightly by a moron.